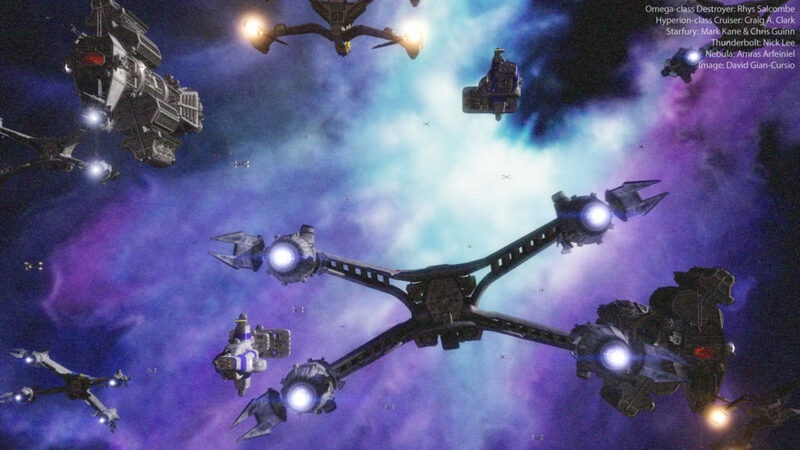 A quick-ish Babylon 5 shot. In direct defiance of my experiments a few days ago, the many fighters on-screen were not instances (I would’ve had more if they were), but were loaded in from a very old scene and hand-arranged. The trouble is, each model contained multiple objects and lights, which as far as I know doesn’t play nicely with instancing. I could’ve created single-object versions of them specifically to be instanced into large squadrons, but who has that kind of time? Not me, not anymore. Perhaps when this is all over I’ll try to settle on to a one-render-a-week schedule so I can remain fresh while still allowing myself time to do other 3D stuff that doesn’t go directly on the screen. Not to say I regret doing this, I’m really happy about having so much new output to look at and build on (I’ve probably already exceeded the previous five years combined). There’s another interesting thing I don’t have time to investigate. I tried to create a dolly-zoom effect so there’d be a lot of radial motion blur to create a feeling of acceleration, but it didn’t come out with any visible blur at all. I’m not sure why, but it’s something to put a pin in and revisit later on. This was an older scene that I wasn’t quite happy with on my first attempt. I replaced the Enterprise with my modified version, and altered the lighting. I added in some clouds from an old sky photo give the background some nebular depth. I designed it with the idea of a companion piece from the opposite angle in mind, so the idea is that there’s a blue nebula behind the Enterprise and a red one behind the Klingon ship. It might just make the lighting look incongruous, though. I also had to run off another pass of stars to get them to show up (I really miss rendering in passes), and did some minor touch-up work in Photoshop in addition to my usual grain-and-bloom to patch over a rendering error on one of the Enterprise’s hull markings. Another simple shot today. I wanted to experiment with a very wide-angle lens. I’m finding that stars are tricky in 5K. In reality, stars are so distant they may as well be single points, but they’re also bright enough that if they show up at all in a photograph, they’ll “bloom” outside of a single pixel. I don’t like having well-defined, circular stars (which I do my best to blur), but if I kept them down to a pixel or two in size, they wouldn’t resolve at all on most screens, between conventional resolutions and low dynamic range. Perhaps, on an HDR display, the most accurate-looking stars would be super-bright single pixels (though on such a display, you also wouldn’t need post-processed bloom, since the image would be exactly as bright as it would be in reality, so the viewer’s eye would naturally see bright objects as having glare). Of course, in reality, you wouldn’t be able to see a single star in a photo like this, though from what I’ve read from astronauts, a few stars actually are visible to the human eye even when looking objects lit by the sun. I’ve mentioned before that portrait-oriented work is largely missing from my oeuvre thanks to the fact that, well, screens are horizontal. Books, posters, and smartphones, however, are not, so it’s something I’ve been meaning to address. Today’s image is an alternate cover design for a Star Trek novel, Ex Machina. I was a little burned out from yesterday’s fairly elaborate image, so I went for something easy today. There is a little bit of future-proofing involved; the composition is based on a stock shot used in the Babylon 5 episode “Points of Departure.” I didn’t duplicate the animation, but it’ll give me a start whenever I come to that shot in my other project. Not every experiment can be a success. I was thinking that I’d have a ’60s-style radiating-sparks effects where the Archer’s phasers hit the Klingon shields, but I drew a blank on how to actually generate it. I also wanted to try adding diffraction spikes to the stars, but that also came up short. On the plus side, I think this is my first finished dramatic image with my Archer model. 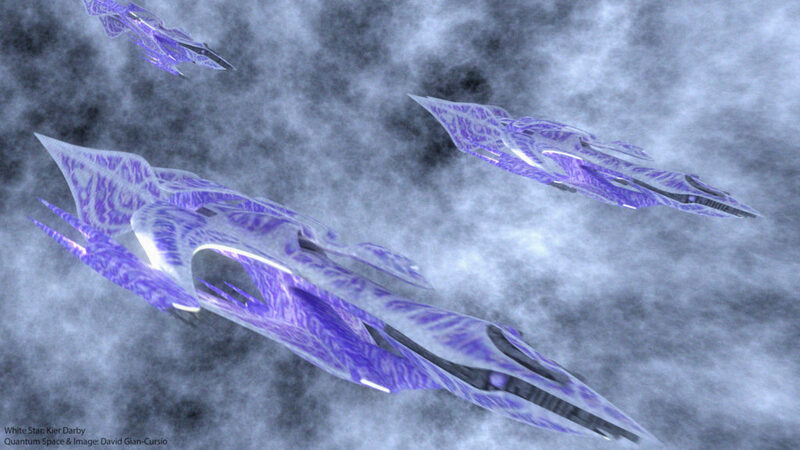 I recently mentioned wanting to attack “quantum space” from the most recent Babylon 5 production, “The Lost Tales.” Quantum space was a faster version of hyperspace. From what I remember hearing, it was actually a late addition to the script, so the quantum space effect was just the updated B5 hyperspace environment Atmosphere Visual Effects was already building, recolored from red to blue. 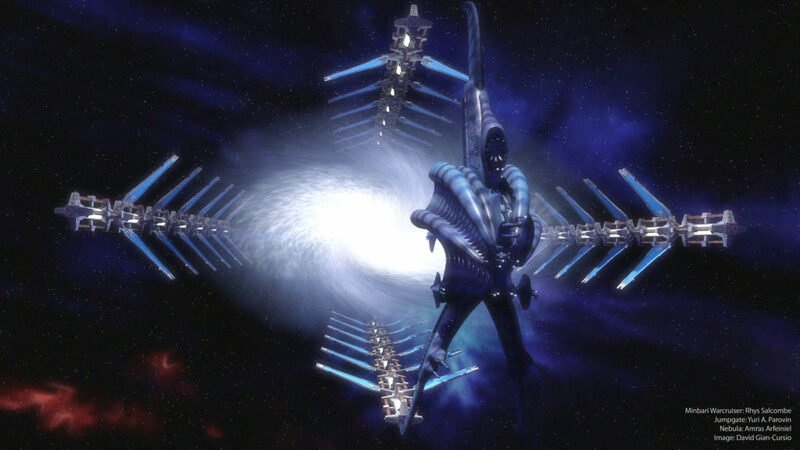 I’m taking TLT as a sort of baseline style guide from my Babylon 5 project, so if I want a hyperspace model that reflects the most recent look of it, then I’ll need to emulate the TLT effect. More quantum space today. The real meat is in this tiny test-rendered animation. I think I’ve just about nailed the animation and arrangement, and even that weird ring-thing. The scene lighting is a bit trickier to get down, but that’s true for any sort of hyperspace-style environment like this that doesn’t have traditional light-sources or, potentially, laws of physics. I have a feeling rendering in passes and generous amounts of post-processing effects will make it look suitably surreal and alternate-dimension-y. Next up will be adjusting it to match the red-colored look of Babylon 5’s original hyperspace, and then I can put this one in the books. As promised, with a few modifications, quantum space has become hyperspace. Aside from recoloring from blue to red, I made the bright bands pulsing from one end of the environment to the other more subtle, and added proxy objects and lights to represent the “lightning flashes” that were present in the Babylon 5 version of hyperspace. Another picture from clearing out my mental junk drawer. 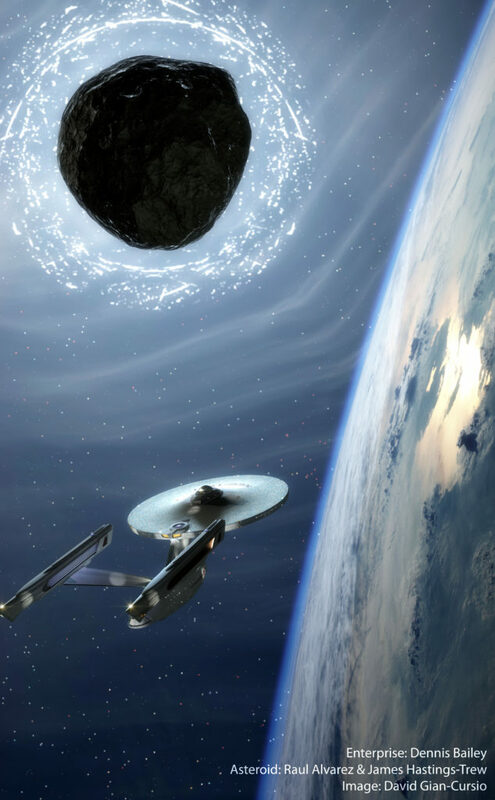 The idea was a Klingon spy photo of the U.S.S. Challenger, a model by Dennis Bailey which combined the design cues from the Enterprise from the 2009 Star Trek movie with the proportions of the original design. In my head, I decided it was a one-off prototype trying out the design features that became mainstream in the timeline of the remake films, but which didn’t catch on in the original Star Trek universe. I conceived of the shot as an animation, and I may take another whack at that concept, since my original idea is very different from what I ended up with. I changed the setting to the Utopia Planita shipyards at Mars, and populated the scene with ships and drydocks. I intended to mark up the image with Klingon text, my computer isn’t seeing the Klingon fonts for some reason. All in all, I’d say this is a bit of a dud of an image, which isn’t surprising considering the amount of supporting infrastructure I’d have to put into it to get it right (starting with a full Klingon graphics package).